Newsjacking can increase your SEO and website traffic by injecting your own thoughts and ideas on trending news stories. Healthcare newsjacking is the same. Cull the web for trending healthcare topics and then write about them and publish on your blog. Though similar to curating, newsjacking differs in that stories are published timely. The best time to release a newsjacking story is before it becomes a trending topic. This post corresponds to our latest podcast episode of “Russ and Randy” – a podcast on Healthcare and Medical Internet Marketing. We hope you like “Newsjacking | Use Trending Topics to Grow Your Website.” You can find us on iTunes …and now, ReachMD.com! Russ and I discuss some best practices to newsjacking: how to monitor the web, tools to use to keep up with current events, etc. As an ophthalmologist, it would be natural for me to write an article about this trending topic. 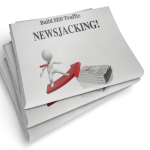 Let’s examine how newsjacking can help me draw traffic to my website. If I write my article before FDA approval, that is, before this becomes a hot topic, my article will be read and shared by patients and followers on my subscriber list. Because this article was published “early,” it will be a popular article to share via social media as this will be “new” news to just about everyone. In my article, I’ll make some comments and opinions about the new therapy. As an ophthalmologist, I’m the natural authority on this subject and my article is very valuable to my readers because it is credible and authoritative. As more and more people share my article, my traffic rises. Because my article is rich in keywords (e.g. gene therapy), my SEO improves. By getting my article published “early,” journalists and reporters eager to learn more about the subject will be culling the Internet for authorities on the subject. My article will naturally appear. As a result, I might be interviewed, my article may be referenced, I may get valuable backlinks, etc. – all improving traffic and SEO. The scenario above is ideal. Newsjacking works best by publishing an article just before it becomes trendy and before the journalists have found their sources. An article written after FDA approval will still be exciting and interesting to my readers. My readers trust me and love to hear my opinions. Social sharing will occur and is still of great benefit to build traffic. It’s less likely, however, that I’ll be able to a noted authority by the journalists and reporters…as the “cat is out of the bag.” I’ll lose the benefit of being associated with the content published by the journalists. My article is basically old news. Very interesting, very trusted, but not trending. Least likely to be shared.